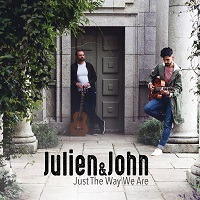 Not to be confused with the Julian and John duo of Bream and Williams fame, Julien and John are Julien Colarossi and John Keogh, two fine guitarists in their own right. This is the Dublin duo's second release, eighteen months on from Street Life (Self-Produced, 2016). Like their debut recording, Just The Way We Are sees the duo trawl the pop charts for inspiration for its acoustic instrumentals, drawing from the 1960s until the present day. The greater vibrancy on this follow-up CD is no doubt the dividend from three years of gigging, with more space for improvisation spicing up the duo's meticulous arrangements. Colarossi's archtop guitar and Keogh's Spanish guitar interweave the langauges of jazz and classical music in a form that is highly structured yet inherently playful. Typically, Keogh introduces the defining melodies while Colarossi comps rhythmically, the roles then reversing as the Italian stretches out. Colarossi is one of the most in-demand guitarists on the Irish jazz scene and it's easy to see why; his highly attuned harmonic and rhythmic comping, notably on a lovely rendition of Paul Simon's "Bridge over Troubled Water," and the uncluttered logic of his improvised narrativesthe solo on Stevie Wonder's "Golden Lady" is especially notableare compelling in their own right. Keogh, like Colarossi a graduate of Dublin's Newpark College of Music, is perhaps less of a musical free spirit but is an equal partner in the special chemistry that pair enjoy. Highly enjoyable it is too, from the infectious funk of Bruno Mars' "Uptown Funk" and beautifully rendered balladry of Billy Joel's "Just the Way You Are" and John Lennon/Paul McCartney's "And I Love Her" to the unabashed joy of Justin Timberlake's "Can't Stop the Feeling," Colarossi and Keogh cover broad stylistic terrain. There's warmth and finesse in equal measure on Stevie Nick's "Dreams," Stevie Wonder's "Don't you Worry About a Thing"with a tasteful Wes Montgomery-esque solo from Colarossiand the funk-lite of Michael Jackson's "Off the Wall." The duo turn to the movies with a short, but achingly tender reading of Jerry Goldsmith's "It's a Long Road" from First Blood. As familiar as all these classics are, arguably the most distinctive tunes of the set are the two originals. 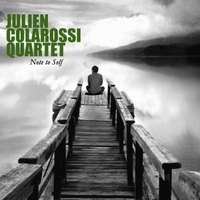 Colarossi's "Effimera," a reworking of a particularly lyrical composition from the guitarist's debut as leader, Note to Self (Self-Produced, 2013) and Keogh's gently hypnotic "Something at Sea" are both utterly persuasive and suggest that more original material of this quality might open up a whole different type of gig for the duo. Instantly accessible, repeated listening reveals more of the subtleties of the guitarists' interaction. It will be interesting to see how this talented duo develops its repertoire, but on the evidence of this fine recording you get the feeling that Colarossi and Keogh could take this in any direction they so choose. Track Listing: Uptown Funk; Bridge Over Troubled Water; Just the Way you Are; Dreams; Don’t you Worry ‘Bout a Thing; Effimera; Can’t Stop the Feeling; Golden Lady; It’s a Long Road; Off the Wall; And I Love Her; Something at Sea. Personnel: John Keogh: Spanish guitar; Julien Colarossi: archtop guitar.